Background and Aim: Liver and thyroid hormones are powerfully correlated so thyroid hormone abnormalities are seen in patients of liver diseases We evaluated serum thyroid hormone levels in chronic hepatitis C cirrhotic patients with and without hepatic encephalopathy. Patients and Methods: Our study was carried out on one hundred patients with chronic hepatitis C (CHC) related liver cirrhosis (66 male and 34 female). they were divided to three groups: Group I which included 40 patients proved to have liver cirrhosis due to CHC with hepatic encephalopathy (26 male and 14 female), Group II which included 60 patients proved to have liver cirrhosis due to CHC without hepatic encephalopathy (40 males and 20 females), Group III which included 20 healthy subjects was taken as control group (12 males and 8 females). Free tri-iodothyroinine (FT3), free thyroxine (FT4), total T3, total T4 and thyrotropine stimulating hormone (TSH) were tested. Results: (Group I) and (Group II) showed a significant decrease in T3 and FT3 levels compared to controls (Group III) whereas there was no difference in serum T4, TSH and FT4 levels. all (Group I) had significantly reduced levels of T3 and FT3 compared to (Group II), whereas there was no difference in T4, FT4 and TSH levels. Conclusion: Patients with chronic CHC have significant lower serum FT3 and T3. 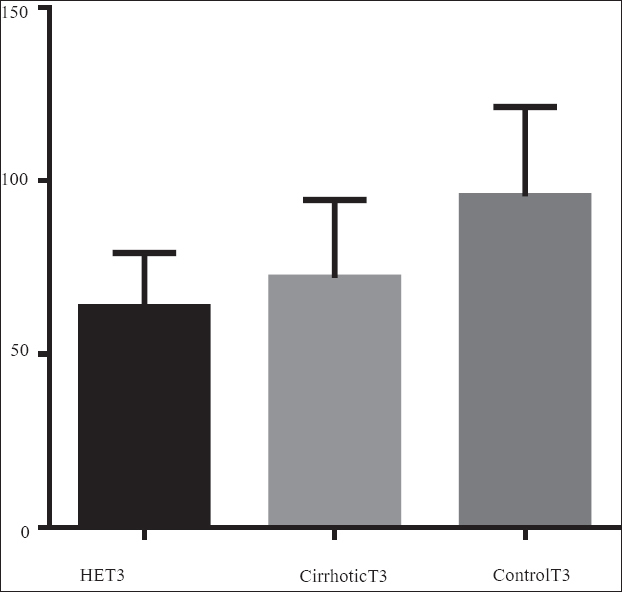 Patients with hepatic encephalopathy were found to have exceedingly low serum T3 and FT3 levels. Depressed serum T3 and FT3 levels, together with a prolonged prothrombin time and hypo-albuminemia, therefore appear to be characteristic of decompensated cirrhotic patients prone to develop hepatic encephalopathy. 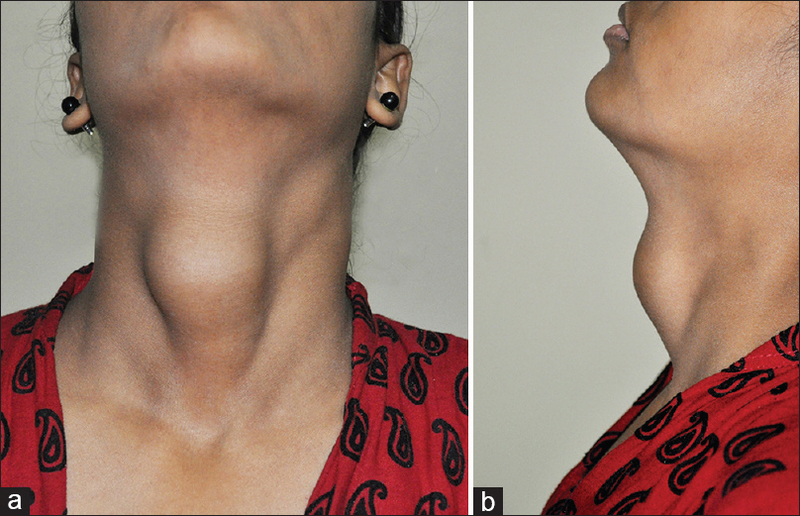 Background: Thyroid nodules are very frequent, with an annual incidence rate of 4-8%. Thyroid fine needle aspiration cytology (FNAC) is more than 50 years old and is the principal method of preoperative diagnosis in both children and adults. Aims: (1) To assess the pattern and frequency of thyroid lesions in cytology, (2) To study the correlation of thyroid lesions with different age groups (3) To identify the frequency benign and malignant thyroid lesions in cytology, (4) To report the thyroid lesions in Bethesda system of reporting pattern on cytology. Settings and Design: Rural Institute of Medical Science and research is a 750 bedded tertiary care institute. This is a retrospective study. Materials and Methods: 300 thyroid lesion (from December 2012 to May 2014) who attended the pathology department of Rural Institute of Medical Science and research was taken and association between variables and thyroid lesions were observed. Thyroid lesions were also classified according to Bethesda system of reporting. Statistical Analysis Used: SPSS. Results: Male to female ratio was 1:9. Frequency of benign thyroid lesions is 78% with the most common diagnosis being colloid nodule and colloid cyst. Thyroid malignancies were diagnosed in 5% cases. 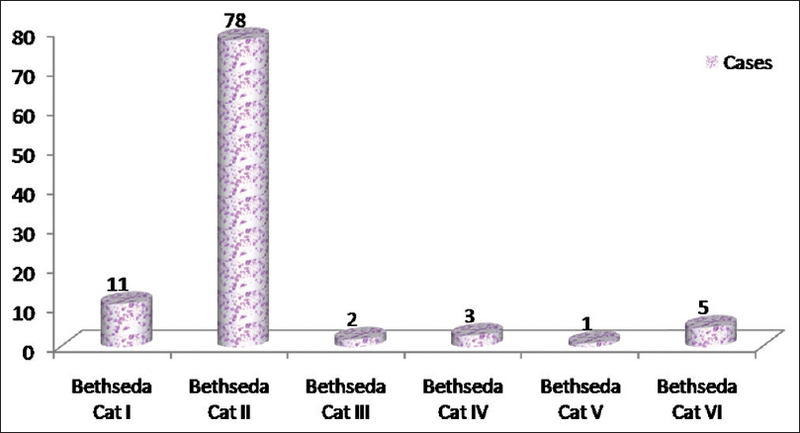 Bethesda category I included 11%, category II 78%, category III (AUS/FLUS) 2%, category IV (Follicular Neoplasm) 3%, category V (Suspicious of malignancy) 1%, category VI (malignant) 5%. Conclusions: Thyroid lesions can be efficiently classified on cytology.The Bethesda system has proved useful and helped improving communication between cytopathologists and clinicians leading to consistent management. Background: Family studies in developed countries show an increased prevalence of thyroid autoantibodies in first degree relatives of children with autoimmune thyroiditis (AIT). Such data is scarce from developing country setups. Materials and Methods: Thyroid profiles and autoantibodies were evaluated in 50 first degree relatives of 50 children with AIT. Results: Eleven (22%) subjects had raised thyroid stimulating hormone (TSH); 4 fathers (42.5%), 3 mothers (12%), 1 brother (33%) and 3 (23%) sisters. Three (6%) showed thyroid profiles consistent with hypothyroidism. Levels of triiodothyronine (T 3 ) were raised in 7 (28%) mothers and 2 (15.4%) sisters while 2 (8%) mothers and 3 (23.1%) sisters also had increased thyroxine (T 4 ) levels; none had low TSH or clinical evidence of hyperthyroidism. Anti-thyroid peroxidase (TPO) antibodies were positive in 9 (18%) subjects; 4 mothers (4/25, 16%) 3 fathers (3/9, 33%) and 2 sisters (2/13, 15.4%). 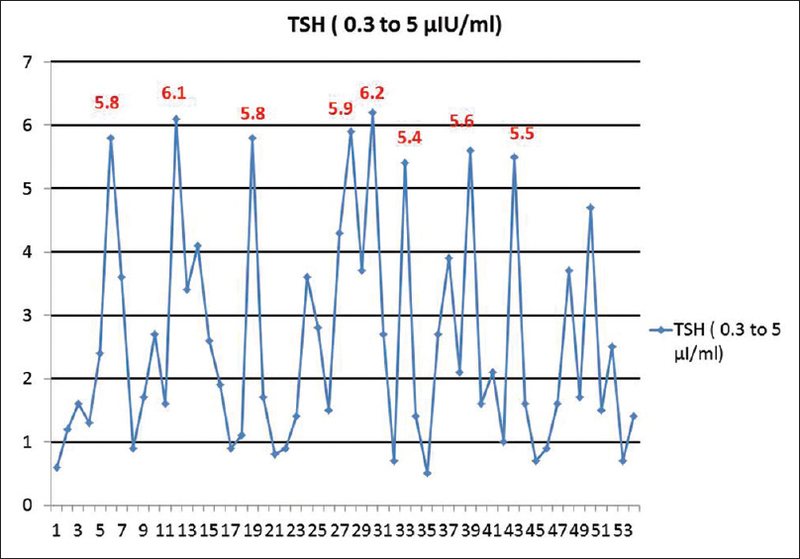 Mean T 3 levels were lower, mean T4 were similar and mean TSH levels were higher in TPO-positive as compared TPO-negative subjects. Anti-Tg antibody positivity was found in 32 (64%) subjects; 14 (56%) mothers, 7 (77.7%) fathers and 11 (84.6%) sisters. Mean thyroid hormone levels were similar in Anti-Tg positive and negative subjects. Two (8%) mothers, 1 (7.7%) sister and 2 (22.2%) fathers had both antibodies in their serum; their thyroid profiles were similar to subjects with anti-TPO positivity. 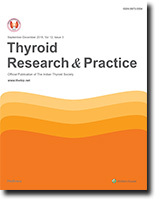 Conclusions: Thyroid dysfunction is present in first degree relatives of North Indian children with AIT. Anti-TPO antibodies are less common but have strong correlation with thyroid dysfunction. Conversely, anti-thyroglobulin (TG) antibodies are commonly detected but correlate poorly with thyroid dysfunction. Objective: Hyperthyroidism is treated with anti-thyroid drugs (ATD), radioactive iodine and surgery. Debate is ongoing over which treatment option is better in terms of producing long term remission and production of fewer side effects. The cost of each option must be considered as well. Therefore, in this study, we analyzed the outcome and actual cost of treatment of patients with hyperthyroidism at our center to see which treatment modality is better. Materials and Methods: Retrospective analysis of patients' treatment records from Jan 2007 to December 2012 was carried out. 52 subjects were considered. We determined the cost of serum thyroid function tests (TSH, FT4 and FT3), hospital visit or hospitalization where necessary, pertechnetate scan, RAI therapy, ATDs and surgery in US Dollars (US$). To calculate the costs of each treatment modality, we analyzed the number of visits during this period, the laboratory data and the drugs needed. Results: All the 52 patients had received initial treatment with thionamides. 12 patients (23.1%) had subtotal thyroidectomy before coming for RAI therapy. Results showed that 12 months following RAI, 32 patients were hypothyroid and 17 became euthyroid and only 3 remained hyperthyroid; giving a remission of about 94.3%. The total average cost of treatment with lifelong ATD for average of 20 years is $1200; the mean total cost of surgery is $1500, while RAI therapy cost an average of $1000. Conclusion: In our environment the most cost effective treatment option for hyperthyroidism is RAI hence, we recommend it as first line in suitable patients. Context: It has been widely reported that thyroid gland is very much prone to autoimmune disorder. Adenosine deaminase (ADA), an enzyme distributed in the human tissues, is considered as nonspecific marker of cell-mediated immunity. Also it is suggested to be an important enzyme for modulating the bioactivity of thyroid hormones, but its clinical significance in thyroid disorders is not yet characterized. Therefore this study aims to see association between serum ADA and different thyroid disorders if any. Research Design and Methods: This was a hospital based cross sectional study conducted in Immunoassay laboratory of Department of Biochemistry, BPKIHS. A total of 122 subjects were selected and divided into five groups: Group 1 (Euthyroid), Group 2 (Overt Hyperthyroid), Group 3 (Subclinical Hyperthyroid), Group 4 (Overt Hypothyroid) and Group 5 (Subclinical Hypothyroid) based on the thyroid function status. Samples were stored at − 20 o till the assay of parameters. Thyroid hormones; thyroxine (fT4), triiodothyronine (fT3) and thyroid stimulating hormones (TSH) were assayed by Enzyme Linked Immunoflouresent Assay (ELFA) technique. Serum ADA activity was estimated by spectrophotometric methods of Giusti and Galanti. Data are presented as mean ± SD. Statistical analysis done by Chi-square test and one way ANOVA. P <0.05 considered as significant. Result: Out of 122 subjects 91 were female and 31 were male, showing the female preponderance of thyroid disorders. There was significant difference in ADA activity in different thyroid disorders (P < 0.001). Conclusion: The females were more prone to thyroid disorders and there was significant difference in ADA activity in different thyroid disorders. Our findings suggest that ADA may play a role in the pathophysiology of thyroid disorders, however a large scale study is required to predict the relationship. Objective: The objective was to determine the overall risk of hypothyroidism (clinical and subclinical) after hemithyroidectomy for colloid goiter. Materials and Methods: Prospective review of 54 patients who underwent hemithyroidectomy for colloid goiter at a tertiary care center from January, 2010 to December, 2012 with regular follow-up. Results: A total of 54 patients were included in the study with 38 females and 16 males (M:F = 1:3). Mean age was 38 years (range: 23-59 years). All underwent hemithyroidectomy for preoperative diagnosis of colloid goiter, which was confirmed on postoperative histopathological examination. Patients were kept on regular follow-up with repeat thyroid function tests after every 6 months. Mean follow-up was 30.7 months. Subclinical hypothyroidism was found in 8 patients (14.8% prevalence) at a mean follow-up of 16.7 months postsurgery. 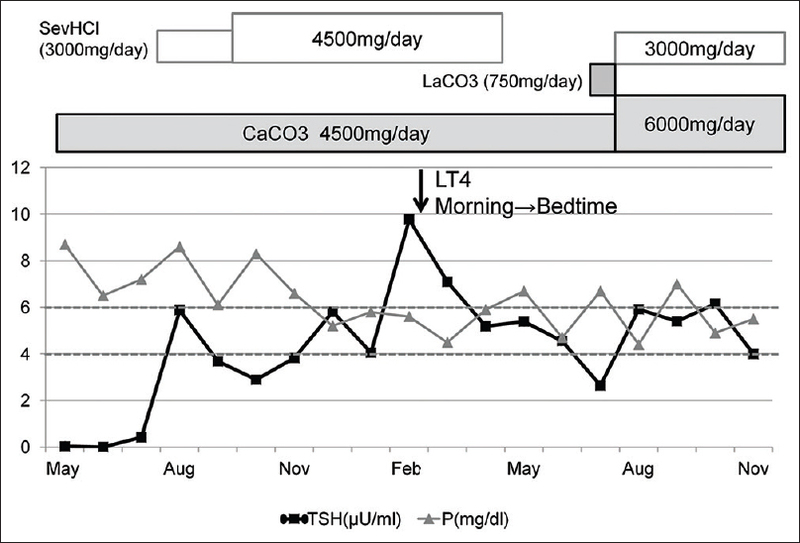 T3 and T4 levels were within normal limits in all patients with no clinical hypothyroidism detected. No patient was on thyroid hormone supplementation. Conclusion: Our study shows a 14.8% prevalence of subclinical hypothyroidism following hemithyroidectomy for colloid goiter. Patients with subclinical hypothyroidism are at an increased risk of developing clinical hypothyroidism. The risk of hypothyroidism after hemithyroidectomy is an important element in decision making for individual patient and health care provider. Thyroid ectopia is a dysgenesis of thyroid gland. A series of seventeen patients with ectopic thyroid tissue and dyshormonogenesis is presented here. Patient data were reviewed retrospectively for this descriptive study. 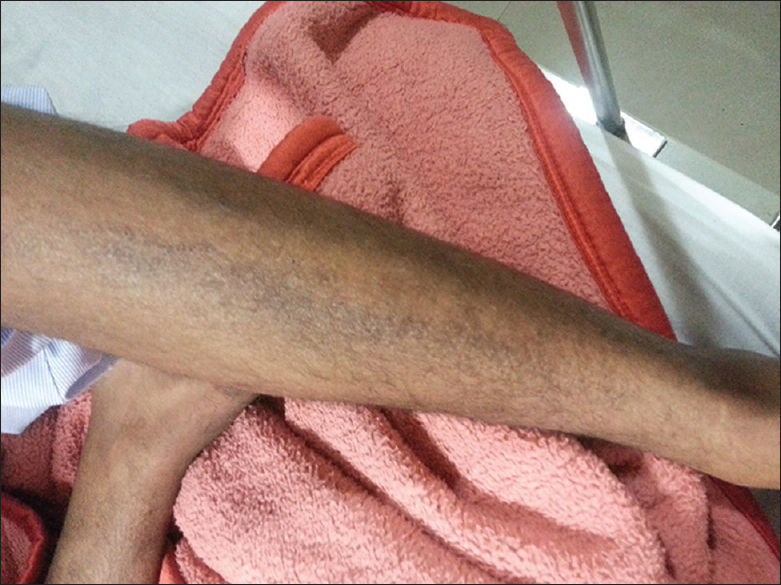 At presentation, age of the patients ranged from 2 months to 50 years (mean age -13.7 yr). Male to female ratio is 1: 7.5. Hypothyroidism is present in 94.1% cases whereas 5.88% (one case) cases have thyrotoxicosis. Though dyshormonogenesis was the main reason for reference of these cases to our department, a variety of other symptoms like dysphagia (5.88%), obstructive sleep apnea (5.88%), swelling in the neck (17.6%), slow growth were also present (5.88%). Other than thyroid replacement therapy for hypothyroidism and radioactive iodine therapy for thyrotoxicosis, surgical removal was advised in two cases of persisting obstructive symptoms. Autoimmune polyendocrine syndrome II (APS II) is defined as Primary adrenal insufficiency with Autoimmune hypothyroidism and/or Type 1 Diabetes. Hypothyroidism is commonly diagnosed but adrenal insufficiency often gets missed out. Levothyroxine replacement before glucocorticoid replacement in a patient APS II can lead to precipitation of adrenal crisis. We report a case of Autoimmune polyendocrine syndrome type II (Schmidt syndrome) who presented to us in adrenal crisis after having started on Levothyroxine without glucocorticoid replacement. 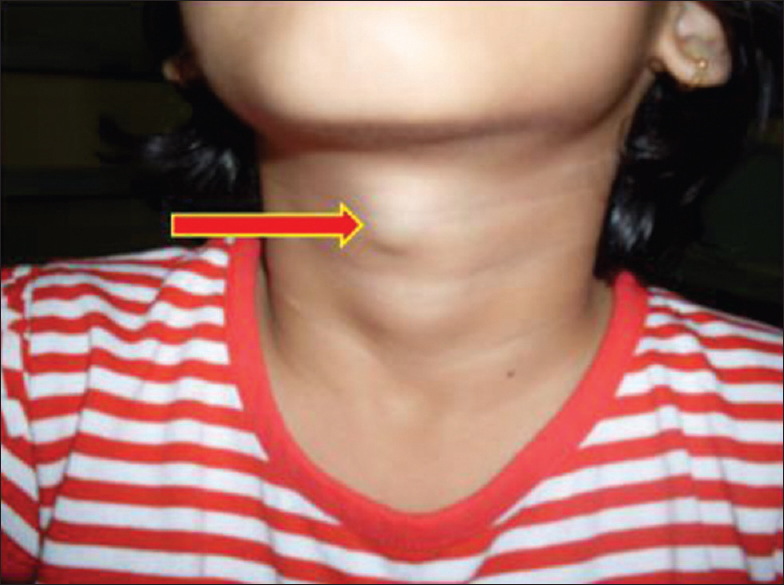 We report a case of euthyroid young female with anterior midline neck swelling, non-tender gradually increased to present size since childhood. On anatomic cross sectional imaging ultrasonography (USG) and computed tomography (CT) scan showed multiseptated cyst in the midline neck, infrahyoid region with absent thyroid gland in its normal location suggestive of TGDC with absent normal thyroid gland. Thyroid scintigraphy study detects functioning thyroid tissue within the thyroglossal cyst and patent thyroglossal duct. F18-FDG PET/CT showed no uptake within the thyroglossal cyst and patent thyroglossal duct indicating no evidence of malignancy. This case highlights the role of nuclear medicine as a diagnostic challenging modality and thus aiding in therapeutic decision.